I have no concrete documentation for a time period. I would have to guess it was first made in the mid 1950's. 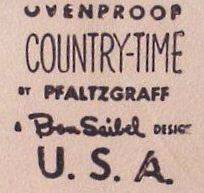 Pfaltzgraff has no set production date; they will only say it is "circa 1952." It is interesting to note in the book "Pfaltzgraff America's Potter" that the author states, "...Pfaltzgraff commissioned ceramic designer Ben Seibel to create new lines." New lines? Did Ben design more than one line for Pfaltzgraff? Solid colors are Aztec Blue, Teal Blue and "Brown." Under glaze decorations are found on Saffron Yellow, Smoke Gray, and "Beige." I have not seen an under glaze decoration on either Aztec Blue or Teal Blue. On "Beige" (this color is a.k.a. "Natural Beige"), the under glaze decoration is in brown. It appears at one time when the Sunburst design was used on the Smoke Gray, the pattern was called Snowflake. What is the story behind the Raymor Modern Stoneware cup found with Country-Time glazes and patterns? 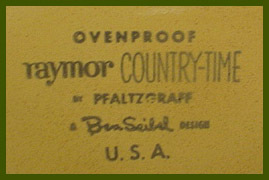 When did Raymor start to distribute? Did Raymor only distribute certain colors or patterns? Was the set in production before Raymor decided to distribute?